Sienna and her Mum, Emma, collected our Norfolk based Viking Pennine Trail tandem at the end of April 2018. This is the second time that they have borrowed it from us. 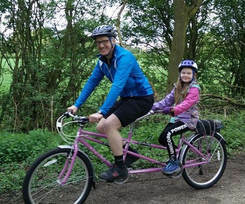 Emma wrote on our Facebook site in mid-May 2018, "Super excited to be out on the Tandem . We really appreciate the opportunity for my daughter to enjoy the pleasure of cycling! A great way to end the day." Ethan and his family collected our Staffordshire based Viking tandem in late April 2018. "Lovely to meet you today. Ethan and I thoroughly enjoyed the ride home, he was laughing with joy before we’d gone too far! We’ve popped out and bought him a new helmet this afternoon as his old one is now too small. Thank you very much, we’ve used the bike twice today and aim to use it regularly from now on." Morven and her Dad, Chris, collected our Glasgow based Viking Pennine Trail in late April 2018. This is the second Viking tandem that they have borrowed from us. More details and a photo are to follow. 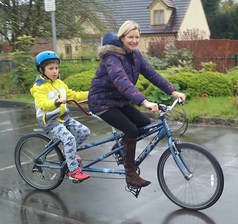 Sam and his Mum, Dad and twin sister collected our Dursley based Viking Salerno tandem called Sadie in late April 2018. They are looking forward to going for family cycle rides for the first time. Fiona and her Dad collected our brand new Viking Pink Link tandem in late April 2018. Helper Matt wrote on our Facebook site, "Fiona enjoyed her test ride and did not want it to stop.". Her Dad, David, then wrote on our Facebook site, "Fiona had a great time today on the tandem. Thanks to all at Charlotte's Tandems for the opportunity to try this. Looking forward to another trip tomorrow." Harry and Gordon collected our Lancashire based Viking Companion tandem in April 2018. David, our Lancs Helpers, said on our Facebook site that Gordon had said, "My ambition is to encourage my friend and neighbour Harry, who has Parkinson's, to exercise and try to improve his Parkinson's symptoms. Harry is not feeling too well today, so hopefully when he is feeling better he will benefit from regular bike rides thanks to Charlotte's Tandems." Scott collected our Edinburgh based Viking Regency tandem in mid-April 2018. In late June Scott wrote that they are "absolutely loving it""
Theo and his Mum, Michelle, collected our Oxford based Orbit Unicorn in mid-April 2018, Here he is with his Dad. 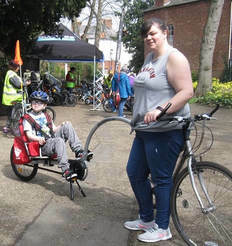 Michelle added a video of her and Theo riding in mid-June on our Facebook site and said, "Active family, now we can all go out and enjoy exercise together!" 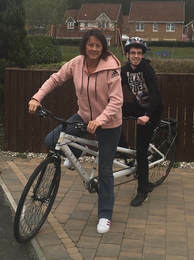 Taylor and his Mum, Kayleigh, collected our Shropshire based Weehoo tag-along bike in mid-April 2018 and an inclusive cycling event. Our Helper, Ray, wrote, "Kayleigh looks forward to taking Taylor to the Town Park using the nice network of cycle paths in the town. Looking forward to your updates and thanks Taylor for your friendly fist bumps!" Noah's family collected one of our Edinburgh based tag-along bikes in early April 2018. Michelle wrote in late April that they hadn't used it yet. Donald's family collected our Edinburgh based Viking Arundel tandem in early April 2018. Michelle wrote, "Donald and I had great fun giving it a whirl around our cycle paths. We have tried lots of short trips to build up Donald's confidence and we are aiming for a good cycle and picnic this weekend." 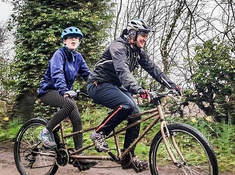 Beth and her Mum, Helen, collected our North Wales based Viking Pennine Trail tandem in early April 2018. Louis and his Dad, Nick, collected our Dursley based Maroon Orbit tandem in early April 2018. They previously had this tandem from us from September 2015 to June 2016. Nick wrote in mid-May, "Here's a pic of me and Louis on the way back from school a few weeks ago. Also, just to let you know Louis and I did 50+ miles the first week we had the Orbit back - L was on Easter hols and I had a few days off. We did a 17 mile trip the one day, way more than he'd done before. L is more keen than ever to ride and finds the Orbit bigger and easier than our Barracuda. Meanwhile, thanks again for the loan of good old no.49 and apologies for the delay in getting back to you, having great fun." Gary's Carer, Rob, collected our Dursley based Claud Butler tandem in early April 2018. This is the second time that they have borrowed a tandem from us. Gary wrote in early 2018, "Gary enjoyed the ride on the tandem, couple of miles from Gloucester towards Upton St Leonards and back mostly along cycle paths." David and Rosemary collected our Cheshire based Viking Valhalla at the start of April 2018. Brian, our Cheshire Helper, wrote on our Facebook site, "Rosemary and David showed determination to come out in the heavy rain today to collect a Viking from our Cheshire Helper. They had tried an adult tricycle (not ours) but ended up in a hedge." 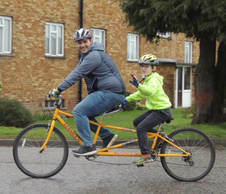 Mason and his Dad, Mark, collected our Hertfordshire based Dawes Toucan tandem at the start of April 2018. Khalid and his pilot, Lawrence, have had one of our Surrey based Dawes Galaxy tandems since the start of April 2018. 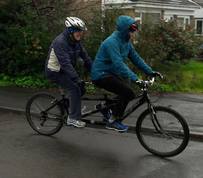 He said at the end of the month on our Facebook site, "On Saturday afternoon, I for the first time tried the tandem. We were planning a 10-min test ride! We ended up riding for 21km  I look forward to longer journeys and more hills ☺️" In early May he wrote, "Lawrence and I started pedalling at 7:15am to catch the ferry to the Isle of Wight. It was my 2nd ride on the tandem after last week’s test ride. Today, we did 70 miles, 1500m elevation, 4 quick stops and lots of cakes/tea/coffee. It was a great experience... I loved riding downhill  We saw 2 other tandems along the way."